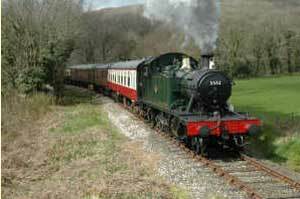 Bodmin & Wenford Railway is the only standard gauge railway in Cornwall to be still operated by steam locomotives. The two branches from Bodmin General Station offer a choice of destination, each travelling through beautiful Cornish countryside. Parkway branch has footpath links to Cardinham Woods and Lanhydrock House as well as connecting with the main line. Boscarne branch joins the Camel Trail. The railway which is typical of a 1950's branch line runs through some of Cornwall's most delightful countryside offering breathtaking scenery and stunning views. The majority of the engines in use are Great Western steam tank engines although there are also some diesel traction locomotives in use. The main station is located at Bodmin General where visitors will also find the engine sheds, gift shop and caf�.